Oligodendrocyte Lineage Transcription Factor 2, a basic helix–loop–helix transcription factor, plays a key role in oligodendrocyte and motor neuron differentiation. Cytokeratins belong to the superfamily of intermediate filament proteins which constitute the cytoskeleton of epithelial cells. 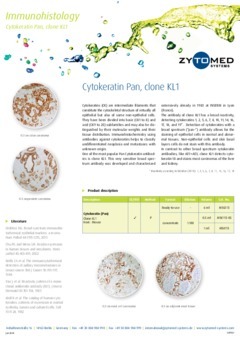 Cytokeratins (CK) are intermediate filaments that constitute the cytoskeletal structure of virtually all epithelial but also of some non-epithelial cells. 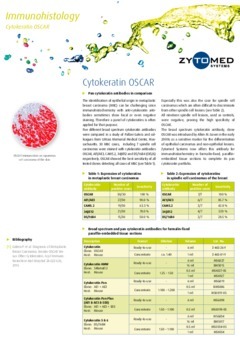 Tenascin C is an extracellular matrix glyco-protein associated with cell motility, proliferation and differentiation. It is widely expressed during embryogenesis but exhibits a very restricted pattern in adults. It is expressed in the lamina propria and in the basement membrane towards the mucosal surface of normal colon mucosa. 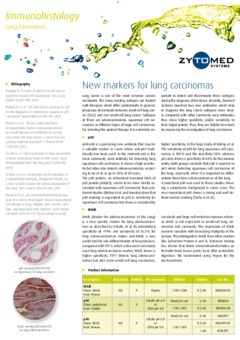 Lung cancer is one of the most common cancers worldwide. 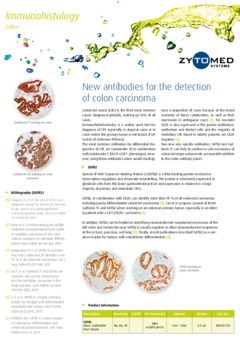 The many existing subtypes are treated with therapies which differ substantially. Breast cancer belongs to the most frequent cancer diseases in women. 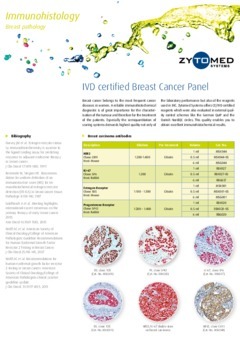 A reliable immunohistochemical diagnostic is of great importance for the characterisation of the tumour and therefore for the treatment of the patients. The diagnosis of metastatic carcinoma from uncertain primaries or poorly differentiated high-grade neoplasms involving the prostate and adjacent organs can be challenging, especially in the setting of limited cancer foci on a needle biopsy. In practice, the histologic distinction between high-grade prostate cancer and infiltrating high-grade urothelial cancer has significant implications because both tumor entities require different treatments (i.e. hormone therapy for prostate cancer and chemotherapy for urothelial cancer). Colorectal cancer (CRC) is the third most common cancer diagnosed globally, making up 10 % of all cases. Immunohistochemistry is a widely used tool for diagnosis of CRC especially in untypical cases or in cases where the primary tumor is not known (CUP, Cancer of Unknown Primary). 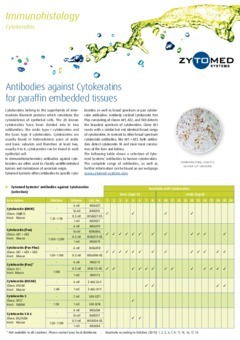 In the day-to-day routine of the immunohistochemistry laboratory ready-to-use antibodies are often a convenient but expensive alternative to concentrated formats. This isn’t necessary! 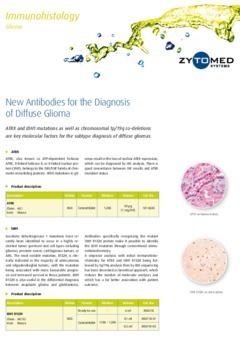 You are looking for ready-to-use antibodies meeting your demands concerning costs, quality and suitability for routine? 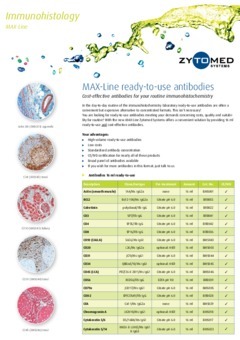 With the new MAX-Line Zytomed Systems offers a convenient solution by providing 16 ml ready-to-use and cost-effective antibodies. 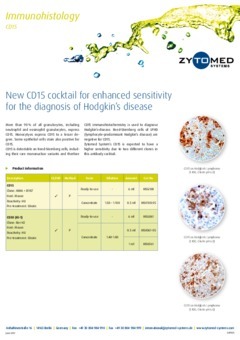 New CD15 cocktail for enhanced sensitivity for the diagnosis of Hodgkin‘s disease. Thyroid Transcription factor 1 (TTF-1) is a member of the NKX2 family of transcription factors. 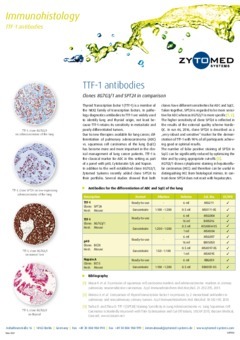 In pathology diagnostics antibodies to TTF-1 are widely used to identify lung and thyroid origin, not least because TTF-1 retains its sensitivity in metastatic and poorly differentiated tumors. The identification of epithelial origin in metaplastic breast carcinoma (MBC) can be challenging since mmunohistochemistry with anti-cytokeratin antibodies sometimes show focal or even negative staining. 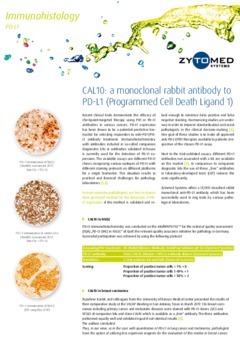 Recent clinical trials demonstrate the efficacy of checkpoint–targeted therapy using PD1 or PD-L1 antibodies in various cancers.